Large Mexican Talavera Christmas Tree - 33"
Large Talavera Christmas Tree - 33"
This large 33" tall Talavera Christmas tree with star will make the perfect festive focal point for your Christmas decor this season. This large ceramic tree is beautifully handpainted with traditional Talavera designs by artisans in Mexico. We will carefully pack your order to ensure it arrives to you safely. Mexican Talavera Christmas decorations make great holiday gifts. Each handpainted Christmas tree may have slight variations from the image shown. 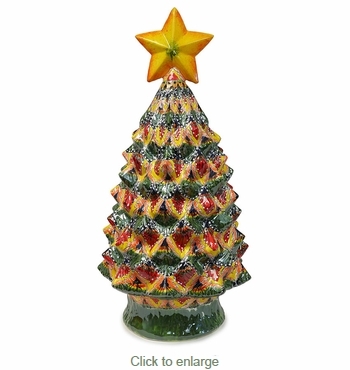 Medium Talavera Christmas Tree - 24"